A recording head is the physical interface between a recording apparatus and a moving recording medium. Recording heads are generally classified according to the physical principle that allows them to impress their data upon their medium. A recording head is often mechanically paired with a playback head, which, though proximal to, is often discrete from the record head. Magnetic - Magnetic recording heads use the principles of electromagnetism to coerce a paramagnetic recording medium, such as iron oxides, to orient in a readable manner such as magnetic tape. Record heads are constructed of laminated permalloy, ferrite, or sendust. As of 2006, this is the most dominant type of head in use. Optical - Optical recording heads use the principles of optics and light to impart energy on a recording medium, which accepts the energy in a readable manner, e.g. by melting or photography. Note that Magneto-optical recording, though using optics and heat, should properly be considered a magnetic process, since the data stored on magneto-optical media is stored magnetically. Earlier systems, such as phonograph records, used mechanical heads known as styli to physically cut grooves in the recording medium, in a configuration (of size, width, depth and position) recoverable as sound. Inside a D6 HDTV VTR Tape Deck, VTR Scanner and video head in place. Diagrams and explanations of recording heads and the tape recording process. An Ampex recording head, deconstructed. 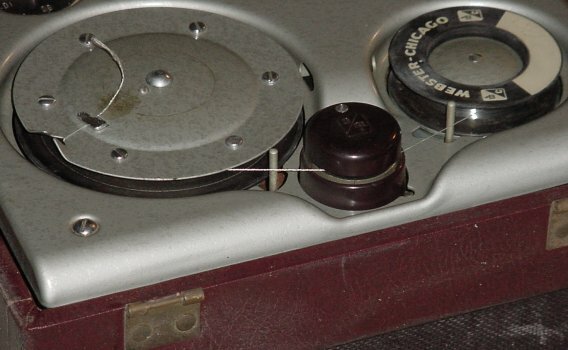 A tape recorder, showing the head assemblies. Photo of an early recording head as part of a wire recorder.